Size 4/6 - $49.99 Only 7 left! Size 7/8 - $49.99 Size 14/16 - $49.99 Only 6 left! We all know that it can be tricky to leave bad habits behind. 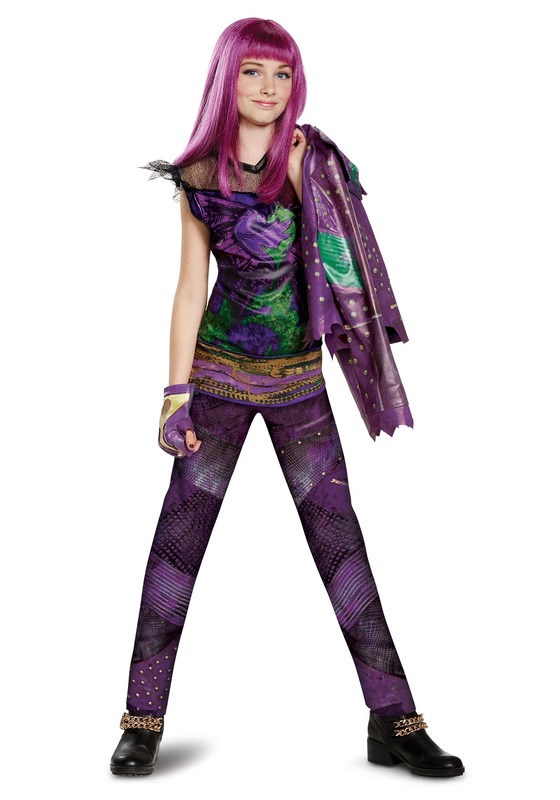 In Disney's Descendant's 2 Mal learns that lesson over and over. She's torn between two worlds. Does she continue to try and make her mother, Maleficent, proud? Or should she embrace this new opportunity to go to school, making friends with the noble, nice, yet sometimes hoity-toity folks around her? Well, it wasn't a surprise to us when her first crush made up her mind. She flip-flops with the pressure of fitting into such a "perfect" world, of course. Why shouldn't she use the magic and talent she was born with? Just because it intimidates others? Well, sooner or later she'll learn to balance the good and the gritty. Cause who wants to be a pretty princess when she can be so much more powerful? 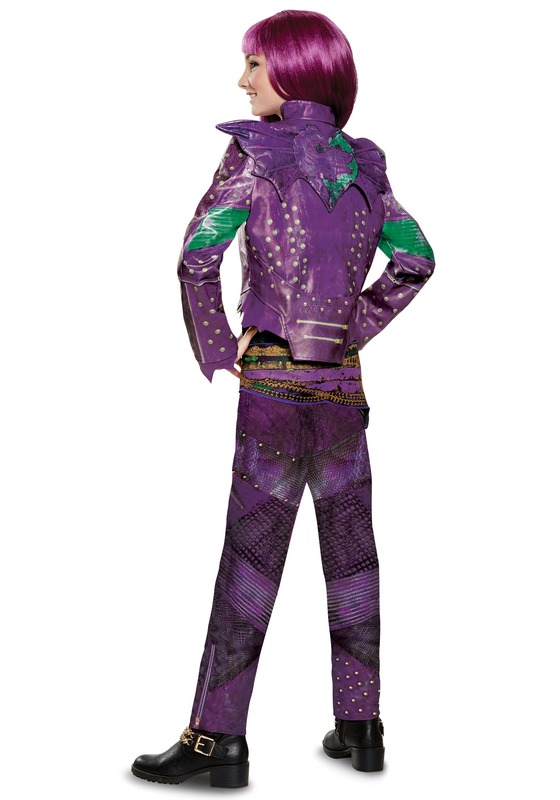 Evie's been at her fashion-design best again with this dark purple ensemble. 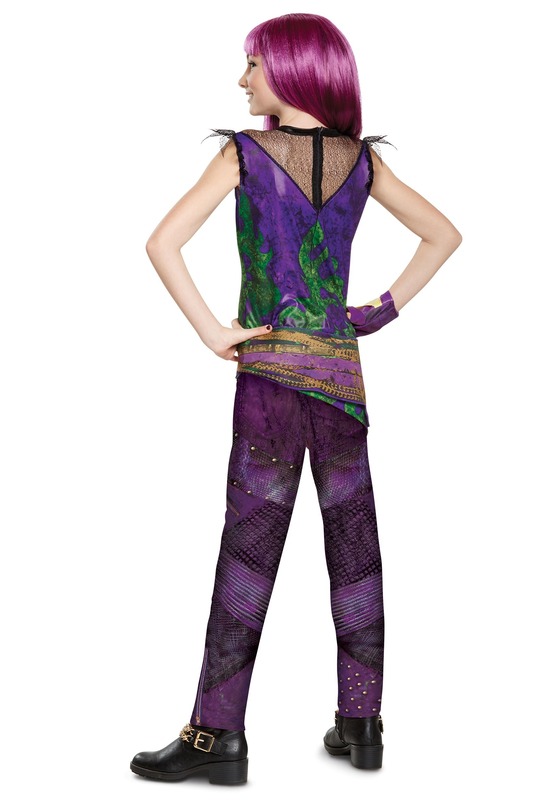 Your child can flaunt all the intricate layer with a separate tank and jacket and straight leg pants. The top contributes to Mal's rockstar personality with a sheer neckline that zips up the back and an asymmetrical hemline that's printed with chains. The jacket is just as cool with 3-D dragon wings attached to the back, a real zipper, and printed zippers and studs throughout the rest of the design. And of course, your kiddo can't be from the Isle of the lost without one of Evie's custom-designed fingerless gloves. With a costume as high-quality as this one, your child will feel like she stepped off the screen and into reality. 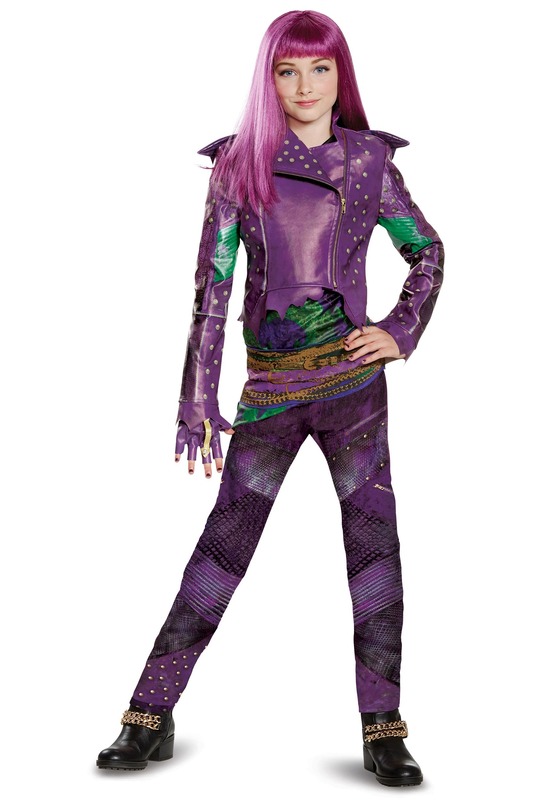 You might even find she wants to use this look to reenact her favorite Descendants song for the school talent show. Just remind your child. Mal's style might be wicked cool but in the end, she always chooses good.